Cebu-based Ocean Fast Ferries Inc. has said its 10th high speed craft in its fleet, the M/V Oceanjet 888, will soon be plying the Cebu-Tagbilaran, Bohol route to serve the travel and tourism industry in the two provinces. The new fastcraft can carry 357 passengers. Vanessa Lua, general manager of Ocean Fast Ferries Inc., said the expansion will address the growing demand of passengers visiting the two destinations. “We expanded our fleet because we see strong market growth for Cebu and Bohol with the development of international airports and other accelerated business activities going on in these two provinces,” said Lua. The Oceanjet Cebu-Tagbilaran route carries an average of 1,500 to 2,000 passengers daily. The fastcraft travels seven times back and forth every day. M/V Oceanjet 888 is an improvement on the company’s nine other vessels, said Oceanjet operations manager Genaro Lastimado. Aside from the improved efficiency, the fastcraft has eight restrooms, among other improvements. M/V Oceanjet 888 is the third vessel of the company manufactured locally by sister company Golden Dragon Fastcraft Builders in Mandaue City. The vessel is designed by an Australia-based company. 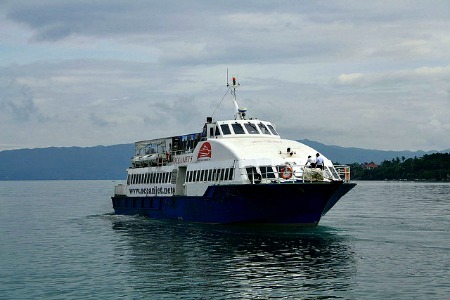 Ocean Fast Ferries also services other routes in Bacolod, Camiguin, Dumaguete, Iloilo, Jagna (Bohol), Ormoc and Siquijor. Of these routes, Lua said the Cebu-Tagbilaran is their fastest growing market. The company is set to launch the Mindoro-Batangas and Roxas-Caticlan routes by November. “It is the company’s vision to expand its fleet and create more routes to link all the islands of the country,” he said. Ocean Fast Ferries employs more than 200 employees. The company joined the fastcraft business in 1995 with its then second-hand but now refurbished high speed craft known as M/V Oceanjet 1. Despite the presence of low-cost airlines, Lua said the fastcraft business remains to be profitable.